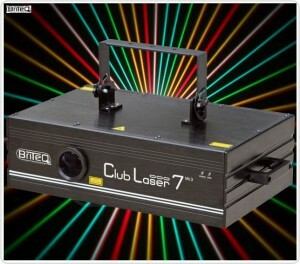 AV Direct has a wide variety of laser lights and show effects units available for hire. In addition to our various smoke machines and hazers, we have the famous JEM K1 Hazer from Martin Pro. In the laser lighting department we have the versatile BriteQ Club7 Laser, which is a superb seven colour laser equipped with 3 temperature controlled lasers. The unit is fully DMX and ILDA compatible for full flexibility. We currently use the Pangolin Quickshow software to control the laser. Full Specs below. 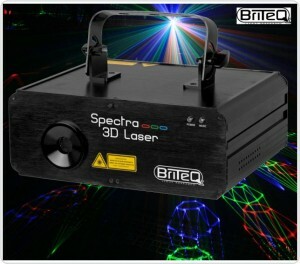 Recently we have added 2 of the new BriteQ Spectra 3D lasers to our arsenal. These multi-colour lasers use high quality 25kHz scanners, combined with 4 effect wheels to create the most stunning effects. With over 80 built-in patterns and amazing 3D effects, this laser is perfect for stand-alone operations or used with our Pangolin laser software. Full Specs below.